This is the commandment and realisation that we bring to any business house. We advise that the entire process running the business should be nourished and regulated by organized data. The entire gamut of technological concepts and resources that we introduce the management to and those that we activate in the business, are the tools that are fuelled by information. 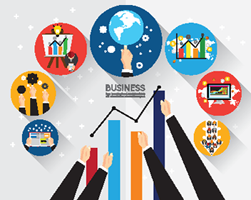 This information is processed in essentially the best manner, to be made available as a statistical presentation on how the business is performing. The brilliance of ever improving technology is making it increasingly desirable and beneficial for a typical business enterprise. We give the distinct advantage of this scenario to our clients, who are scoring by leaps on efficiency, bankability, and profitability. In them, we demonstrate our capability to bring the big difference in efficiency that every corporate entity desires to achieve.